Writing is creative fun, but launching a published book can be a blast! Mark your calendar for Friday, August 12. One lucky winner will receive this fantastic Grand Prize package! The traditional way to commemorate publication of a new book is to have a launch party. Help me celebrate this achievement and support a wonderful local family restaurant at the same time on Friday, August 12. We’ll be at Terranova’s Italian Restaurant in Huntsville from 6:00 to 8:00 p.m. enjoying fantastic cuisine, giving away some great prizes, and autographing books. Prize drawings begin at 6:30. We’ll be giving away autographed copies of Treasures of Dodrazeb: The Origin Key, copies of the anthology Between the Wall and Fire, Amazon.com gift cards, and some beautiful writer’s journals. 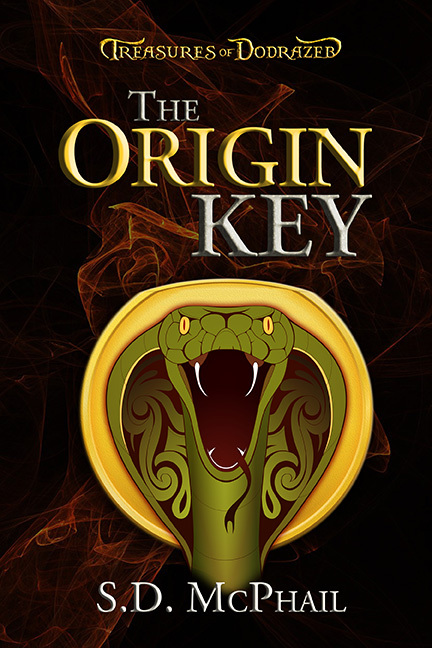 The Grand Prize package, to be given away at 8:00, consists of The Origin Key, Between the Wall and the Fire, an Amazon.com gift card, a writer’s journal, AND an autographed poster of The Origin Key cover art. The Treasures of Dodrazeb: The Origin Key is a sword-and-science fantasy/sci-fi adventure like no other. In the third century, a Persian warrior discovers an obscure culture using something more powerful and dangerous than magic: advanced technology. We’ve also cooked up some fun ideas for Terranova’s menu! For this one night only, get in the spirit of ancient Persia and the mysterious kingdom of Dodrazeb with these cleverly named drinks and appetizers. Kamran’s Calamari—Tender, thinly cut calamari marinated overnight and lightly fried. Served with a spicy lemon butter sauce. Conqueror’s Platter—Fried zucchini, mozzarella, stuffed mushrooms, and stuffed shrimp. Rasteem’s Favorite—Breaded mozzarella triangles served with Terranonva’s house marinara sauce. Laneffri’s Choice—Mushrooms stuffed with spinach, ricotta cheese, Parmesan cheese, bread crumbs, and Italian spices. Dodrazeb Dip—Creamy spinach and artichoke dip with melted mozzarella served with rosemary croutons. Don’t have your copy of Treasures of Dodrazeb: The Origin Key yet? Don’t worry! We’ll have plenty of copies for sale at the launch party.